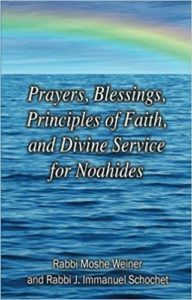 Noahide Prayer Booklet, new 7th Ed. : Click on the image! #6 can also include all the others. A prayer of thanks to G-d for bread at the start of the meal (#1) includes within it everything else that will be eaten within the meal (since bread, which is the “staff of life,” is the most important food), so no mention of thanks for the other foods or beverages within that meal is needed – except for grape wine or grape juice, which has the most important status among beverages. 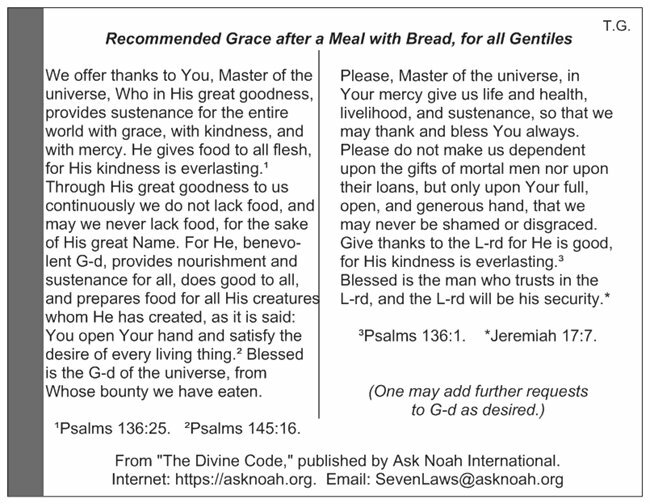 Likewise, a prayer of thanks to G-d for drinking grape wine or grape juice (#4) at the start of a snack or a meal includes all the other beverages that will be drunk within that occasion. So in that case, a separate blessing upon drinking any other beverages afterwards is not needed (even if bread in not being eaten). *From Midrash Rabbah ( Genesis), ch. 54.